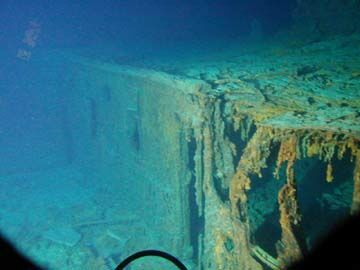 This second dive was intended to gather more information on my developing theory on the true causes of the Titanic disaster. 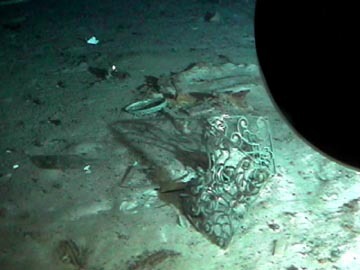 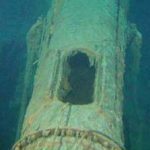 The original goal of this second visit to the Titanic grave site was to find the metal plates that would have been torn from the bottom of the ship as it grounded on an underwater ice shelf extending from the base of the iceberg (See “Titanic sinking Theories”). 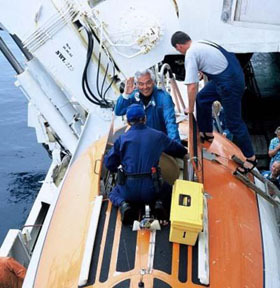 Unfortunately, the diving conditions and equipment problems were not ideal making it difficult to successfully accomplish the mission. 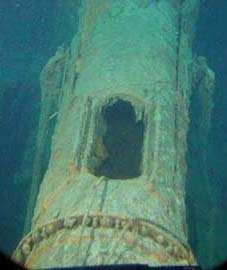 The “sea snow, ” which are tiny organisms that rain down to the sea floor from the water column above, was particularly dense on this dive , making visibility a problem. 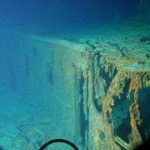 However, during the latter portion of the dive, I did catch a glimpse of the plates I was looking for as I scanned the sea floor, but soon lost sight of them as we quickly drifted passed them in the strong bottom current. 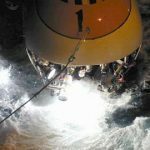 Sadly, once the pilot had been alerted and the submersible turned around, we were unable to find them again before it was time to ascend to the surface. 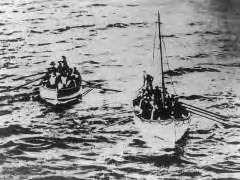 I remain convinced the plates are there, I know their position, and I am confident of one day returning to enable photographic documentation that will prove that a grounding did, in fact occur on April 14,1912. 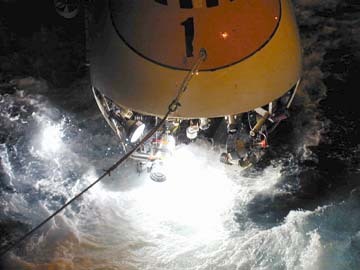 MIR submersibles being retrieved from the ocean at night.